Washington – The Federal Railroad Administration on Friday released its ambitious vision for an overhaul of Northeast Corridor railroads, a plan that would create a new route through Old Lyme and other shoreline towns and upgrade the rail line that runs through the center of the state from New Haven to Hartford and then Springfield, Mass. The NEC Future plan, which is meant to dramatically upgrade and introduce high-speed rail to the Northeast Corridor from Washington, D.C., to Boston, includes plans for a tunnel under Old Lyme in response to concerns the new rail line would harm the town’s historic areas. 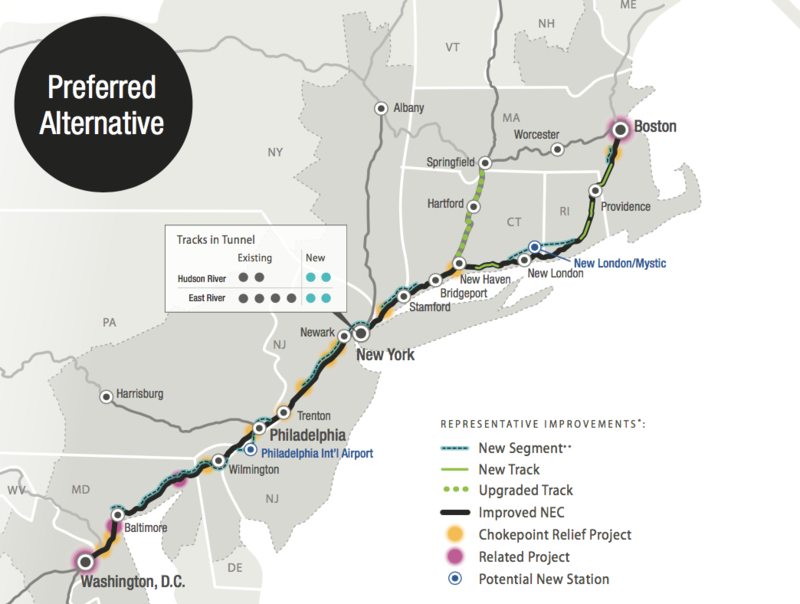 There is support for other upgrades to Connecticut’s rail system the NEC Futures plan would make, however. The FRA said states in the Northeast Corridor will make the final decisions on the overhaul – and help pay for it. The plan is expected to cost more than $135 billion – just the tunnel under Old Lyme is estimated to cost $10 billion – and take decades to implement. The plan says additional rail lines and rerouting of certain segments – like the one along Connecticut’s shoreline – would speed travel from Boston to New York City by 45 minutes and make trips form New York to Washington, D.C., 35 minutes faster. 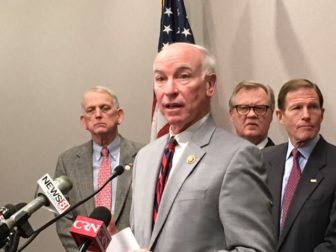 U.S. Rep. Joe Courtney voices objections to realignment of the shoreline rail route. Left to right, behind Courtney are Stonington First Selectman Rob Simmons, State Sen. Paul Formica and U.S. Sen. Richard Blumenthal. Environmental and other studies to be completed in the next, “Tier 2” phase of the program, will take decades. “Successful completion of Tier 2 studies and environmental documents would allow construction to begin,” the report said. That also would take years. But Gregory Stroud, executive director of the nonprofit group SECoast, said the change did not win his support for the new route through Old Lyme and other shoreline towns to Rhode Island. “That’s why we’re here,” said Bonnie A. Reemsnyder, the Democratic first selectman of Old Lyme. Property sales have fallen through over the uncertainty raised by a previous draft plan for an elevated railway through the town’s historic center, she said. Stonington First Selectman Rob Simmons, a Republican who lost his 2nd District congressional seat to Democrat Joe Courtney in 2006, was among the officials who said the FRA plan never could win environmental and other approvals, nor was its $135 million cost feasible. “The visual here of the folks lined up is in many ways the most powerful message. We have folks at every level of government — local, state and federal,” Courtney said. 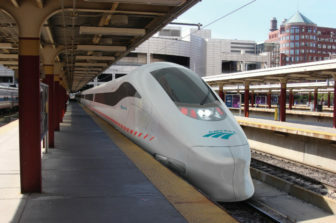 An artist’s rendering of an Amtrak high-speed train in Boston. State Transportation Commissioner James P. Redeker said the state has a long list of rail and other priorities and would not commit state funds to the shoreline portion of the project. Federal officials said the economic benefits of the plan justified its cost. “While building this recommendation would require significant investment, the cost of doing nothing is much greater. The communities and the economies of the Northeast cannot grow and flourish without significant, new investment,” said U.S. Transportation Secretary Anthony Foxx. In 2012, at the urging of Congress, all Northeast states and the Federal Railroad Administration began working together to develop the NEC Future plan. “What quickly became clear, and was universally agreed, is that the corridor’s current capacity is vastly inadequate. Today’s NEC simply cannot meet the demands of today—or tomorrow,” the FRA said in a statement. There will be a 30-day period for the public to comment on the proposal and propose changes to a final plan. The proposed route is a hybrid of several the FRA has put before the public. About a year ago the FRA released three proposed routes, and a do-nothing option.